When I first came across this video, I thought the talented creator Pastek was going to go the Superbad movie route based on the name. While I was wrong on the video direction – this awesome funny retro Mario video is actually about Mario instigating some hilarious fails – the video is still excellent, and still a must see for your Thursday morning. While you may have seen some of the original fail footage in this film, it doesn’t matter – this video will have you laughing continuously! I just stumbled upon Chris Hemworth’s artwork. It’s terrifying and beautiful at the same time. Like when you see a supercell over the plains in the Midwest. But at least these prints won’t tear down your walls – they build them up! What I especially love about these prints is that they’re simple. It’s like a funny inside joke with a bitter aftertaste. But with a nice a frame if you want. And today’s cross section of gaming and popular culture is widening every day. Recently, we found this gem: a Game of Thrones spirited SNES Super Mario Bros. 16-bit musical intro. Today, we find prints worthy of multiple rooms in our house. It’s a good time to be a gamer. What happens when you fuse the epic HBO fantasy miniseries Game of Thrones with the SNES‘ legendary flagship title Super Mario World? You get a freaking masterpiece, that’s what you get! While the above must-see video only covers the intro theme music to Game of Thrones, the quality is out of this world – both in sound and in visuals (Super Mario World’s map really was the perfect choice) – and already has me humming this retro, 16-bit remix in my head, probably all the way to work and back today. If you’re a fan of either GoT or stellar retro video games – which we are both – then you need to watch this video. As in right gosh darn now. Ah junior high. And bad graphics. And short swords that were supposed to be longer but weren’t. We’re not talking Lagoon here (although that game isn’t far off – the sword in that game was shorter than a toothpick and about as strong). We’re talking about Soulblazer. Time for some retro lovin’. Soulblazer, for SNES, was the kind of game you’d play when you told your parents you’d be home in 15 minutes. 30 minutes later, you start questioning what was worse, giving up Soulblazer at your friend’s house, or just taking a larger punishment. Normally, the punishment prevailed. Some games are better than others. Some games are a lot better than others. Then some games put other games to shame. Breath of Fire 3 put every Breath of Fire release after to shame. They should have stopped at the pinnacle. For example, you can turn into a dragon. All it takes is some magic points. Now, you have to find “Dragon Genes” and mix and splice them together, and that was a fun process, but all you had to do was click some buttons and voila: dragon. But nooooo, not for the later games. BoF 4 was ok, but by the fifth installment, the game designers thought, “Hey, let’s make a game about a boy who learns he’s a dragon, but he comes closer and closer to killing himself every time he shifts into dragon form.” Seriously, every time he turns into a dragon his “dragon counter” increases. Not to mention every ten minutes or so of game time he goes up a bit too. *Sigh*. Now this is pretty neat. While many of us have likely already peered inside some of our favorite game controllers growing up, it probably wasn’t due to taking them carefully apart with a screwdriver – so what if we’ve all smashed a few in a fit of rage? That’s totally normal, plus you couldn’t save in pretty much any video game back in the 80’s, so what else were we supposed to do? I digress. 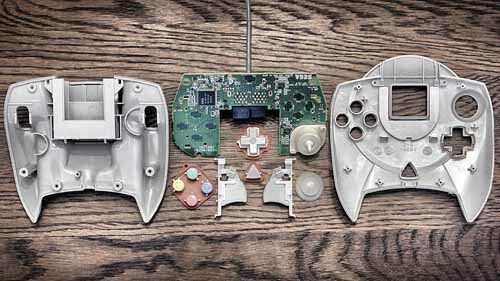 Hit the link below for all the deconstruction photos, and see if you can correctly identify which system each controller belongs to; if you can’t, you were likely born in the 90’s. Oh, and I’ll help all you young bloods out a little by putting them in chronological order, with the oldest ones first. And GO! Yes, I said banana peels. Just over three weeks ago, a 10-year old gamer from Colorado was riding with this grandmother when she unexpectedly experienced a heart attack behind the wheel. With his 4-year old little brother in the back seat of Grandma’s Buick sedan, Gryffin Sanders grabbed the steering wheel and calmly steered the speeding vehicle off the highway and into safety. What does he credit for his successful driving skills? Mario Kart. Chalk one up for the “I told you video games are useful!” crowd. Full awesome story below. 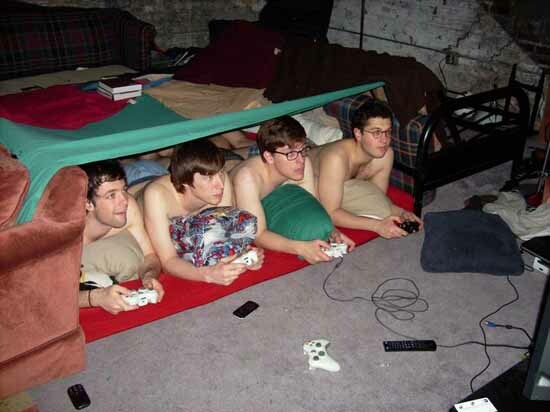 Alright fellas, raise your hand if you ever built a fort in your living room or basement when your buddies came over as a kid. Yeah, we all did; ladies, many of you probably did the same. We also probably both played a crap load of video games when we had our friends over. Since I am now at the ripe age of 30 years, it was primarily the NES, then SNES, Sega Genesis and N64 which carried the bulk of the gaming load, with quite a bit of PC gaming in there as well, courtesy of the entire Command & Conquer franchise (which I dominated, naturally). But when does the slumber party/fort building/male or female bonding go a little too far? Oh, there are lots of ways; I won’t let your imagination stop running. If you really want do laugh, or maybe shudder is a better word, then click below for the oddest slumber party/male bonding experience you will likely ever witness in your lifetime. Where are all my retro gamers at? Raise your hand if you grew up on the NES, and if the top two items on your Xmas list started with a Super Nintendo and ended with a Nintendo GameBoy, and I’m talking the old school brick of a GameBoy with a black and white screen. Color screen? That wasn’t even a rumor at that point; I think the word “fantasy” is a more apt description. All of us at that point in the gaming world were longing for realistic graphics, and in the late 80’s/early 90’s, we still had a long ways to go. The advent of the Super Nintendo really was a neat jump, as it allowed for at tremendous amount more processing power, and maybe above all else, a ton more colors. It really wasn’t until the N64 however until we really saw an epic graphical jump, and now today, we’re about as realistic as we’re going to get. Seeing these amazing photochops (easy to do, really) below really brings back some memories, although I’ll admit, there are some characters where I don’t know the game that they’re from. That’s where you come in; you’re slightly qualified, right? You raised your hand earlier, didn’t you? Gamers are a creative demographic, and when you throw in the fact that many of their mother’s are world class quilters, you’ve got a recipe for nerdiness that would make even Santa Claus face-palm. What would rank even higher on the nerdiness scale is if said gamer is also a world class quilter; or better yet, said gamer and said world class quilter is also a mother. Oh snap! Before I give this retro-ly (I’m making up words left and right today) awesome, funny gaming pic away, hit the link below and you’ll see what I’m talking about. You will not be disappointed.